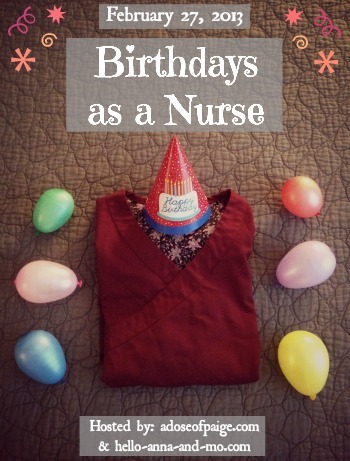 Feb 27: the day nurse bloggers link up to talk about their birthdays October linkup: Because I’m a nurse… Nurse linkup: 5 fun facts about Test Day! December nurse link-up: CHRISTMAS! I’m a three twelves gal also! Hate holiday schedules (esp this past yr) because our turnover was so high so there was no seniority incentive! blah! I’m also super jealous that you can wear that undershirt to work! We can only wear white. 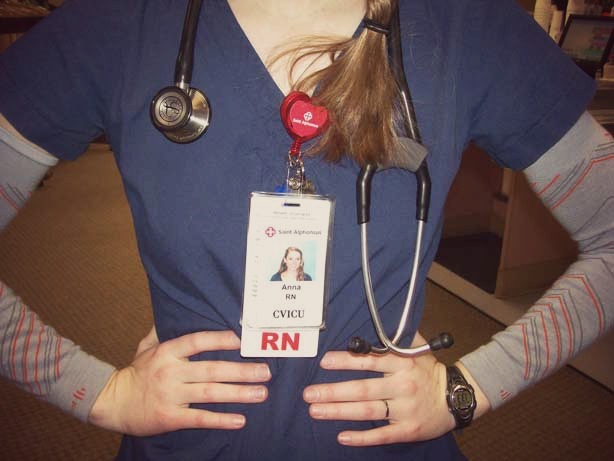 I just posted an RN post the other day with me in uniform! My birthday is March 24, I will be 25 this year. Last year me and a group of friends went to New Orleans and partied after going see the Lion King Musical. Not sure what the quarter of a century birthday will bring me just yet but still pretty excited! I’m hoping to be able to take off this year for my birthday (not until November, but hey, you’ve got to plan these things ahead of time, right!). I really do not want to be cleaning up anyone else’s puke, pee, poo, snot, etc on that day (I work in a pedi office). I guess we’ll see. cute skinny nurse. thanks goodness for the three twelves schedule – minus the holidays. if i had to work five eights i would DIE.